In addition to spending over 4 hours outdoors with friends, you can also try different golf formats to help shake things up a bit. If you’ve been out to the golf course with the same group of friends multiple times, playing the same old stroke play can get old or boring. Luckily, there are a number of different formats you can use to shake things up a bit and add some spice to your friendly competitions. 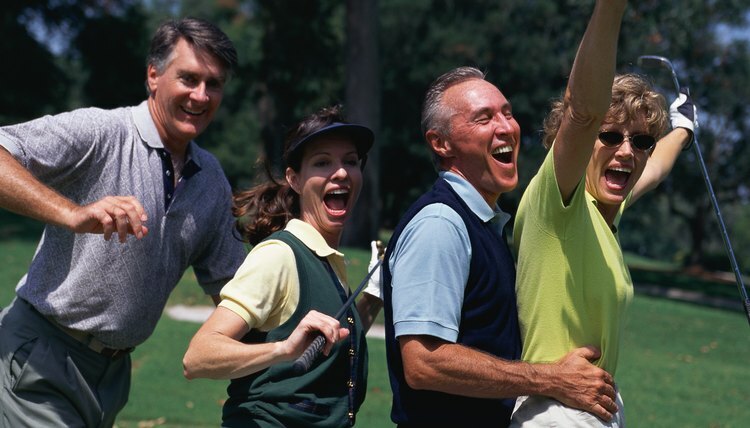 If you’re playing with a large group, such as a company outing or a charity event, the scramble--also known by some as best ball--is the perfect way to make sure everyone has a good time, whether they can play well or not. Groups of two or four compete as a team. Each player on a team tees off, and the best drive is chosen. All players hit the next shot from that spot. This pattern repeats until the ball is holed and a team score is recorded. Some versions require that you to use a minimum number of types of shots--drive, fairway shot and putt--from every player during the course of a round to ensure no one player dominates the action. Another exciting format that can have monetary benefits if you’re so inclined, skins is all about timing. In skins, the player with the lowest score on a hole wins one “skin.” If two or more players tie on a hole, that skin carries over to the next hole. For example, if three players start a skins game on the first hole, and two players par while the other bogeys, the next hole is worth two skins. If one player birdies No. 2 while the others par, he wins both skins. Some players like to assign monetary values to each skin. This fun game features players teaming up in pairs to play alternate shots. Before the round starts, players draw numbers or flip a coin to see who will tee off on even holes and who will tee off on odd holes. Players then alternate each shot on a hole. For example, if Player A tees off and hits the ball in the rough, his teammate must play the ball from there. If Player B hits it just short of the green, Player A plays the chip, and so on until the ball is holed. Players record their score as a team and compete against one or multiple teams.